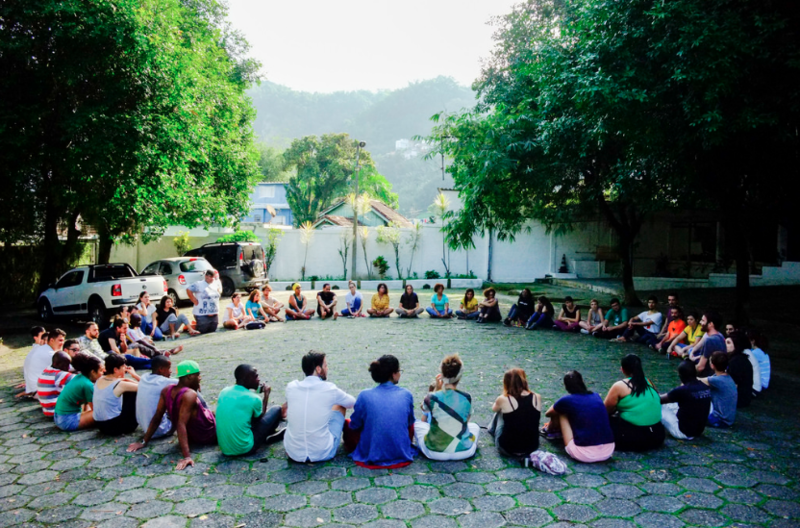 Warrior Without Weapons (1) is a 32-days leadership immersion for social entrepreneurs to enhance their ability to positively impact communities – a program created by Instituto Elos (2), a Brazilian institute focused on community building through bottom-up and collaborative approaches to placemaking. Every year around 40-60 participants from all over the world are selected to partake in the program, based on their readiness to take action. 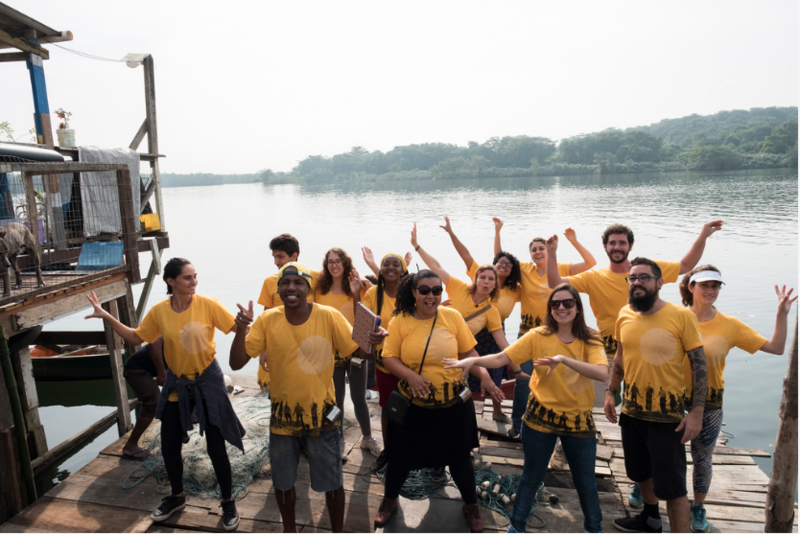 I was ready and lucky to be part of the 2018 edition and to live for the whole month of July 2018 in the city of Santos, state of São Paulo, to learn and act alongside amazing people from 10 different countries including Brazil, Congo, Zimbabwe, Senegal, Turkey, Germany, Italy, The Caribbean, USA, and Mexico, while absorbing Elos philosophy which was develop over the course of 20 years of practice of Elos Institute. Over three months after the completion of the program, I still feel I am in the process of truly becoming a Warrior Without Weapons. It is not easy to describe what it takes to becoming a Warrior, a deep transformation that allows being attentive to how we can collectively recreate the world around us; I will make my best to tell you this story. It all started with a dream, a collective dream. 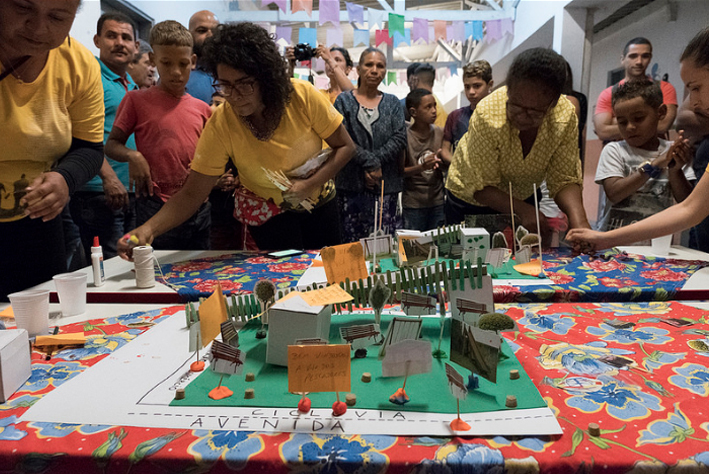 Instituto Elos emerged out of the dream of young architecture students to make of the design and construction phases a collaborative process that brings value in the building of not only places, but also (and mainly) of communities.  Elos Phylosophy gradually became a channel for groups of people and communities to dream together their spaces and development processes. 1 – Gaze (Olhar); as stated in The Little Prince, “what is essential is invisible to the eye”; we can only see with our hearts and when we silence our minds and judgment. 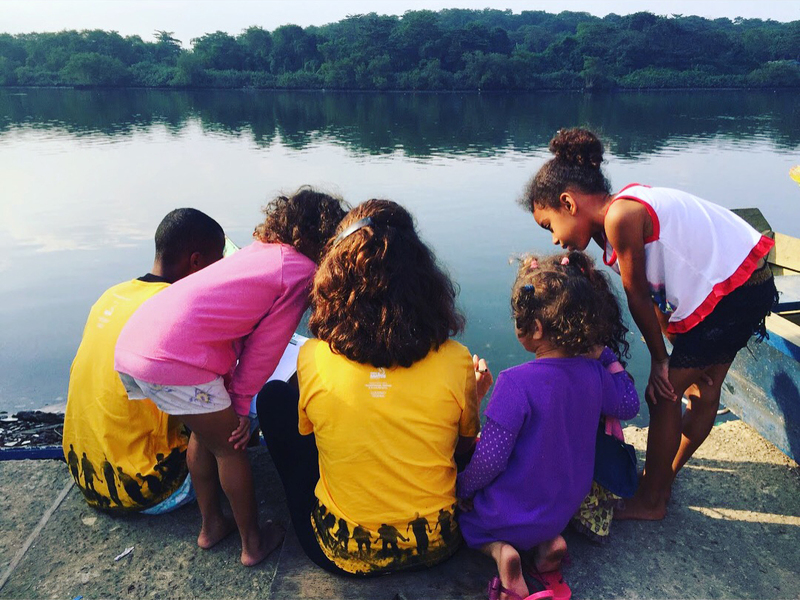 This first step proposes to not only see, but to feel the energy of a community before acting in it, finding its visible and invisible beauties and resources. 2 – Affection (Afeto); a call to walk around the community being open to meaningful conversations with local people. A time to listen more than talk, to be carried throughout stories of those who dwell in the place being discovered; a time to offer not only open ears but mainly open hearts for real connection. 4 – Care (Cuidado); this is the moment to match dreams and plan their collective accomplishment. A time leading to making dreams tangible by planning their strategic steps and creating opportunities for community action. 5 – Miracle (Milagre); here, people, resources and action all come together to make the dream come true. A time for hands-on, collective effort and to reassure that, yes, it is possible to transform the world we live into the world we dream of. 6 – Celebration (Celebração); gratefulness matters. This is why celebrating accomplishments – the miracle itself – is an important part of the path to development. It is when people acknowledge their collective efforts and invite more action and change into their community. 7- Re-Evolution (Re-evolução); what is needed to keep working on all the dreams that were brought to life in action or thoughts? Each community has its own paths…this is what the Re-Evolution step proposes – finding out which strategies work best in a given place to keep the ‘dreams come true’ process alive. 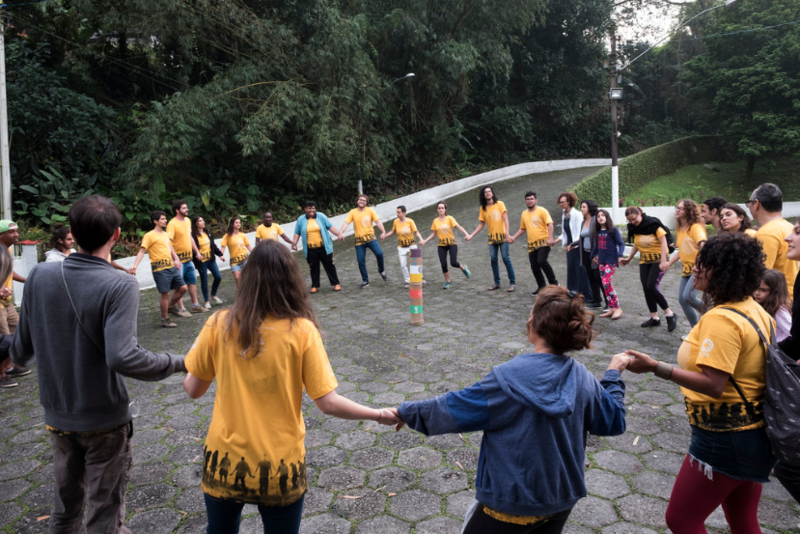 Experiencing this 7-steps in the path of becoming a Warrior Without Weapons at Santos in July 2018 has shown that beyond the methodology itself, so much more happens that cannot be predicted in the script; each step presents myriad of surprises both for individual and collective learning, while making the process richer and more intriguing. The 38 Warriors-to-be were divided into 3 different communities to take action during 21 days. 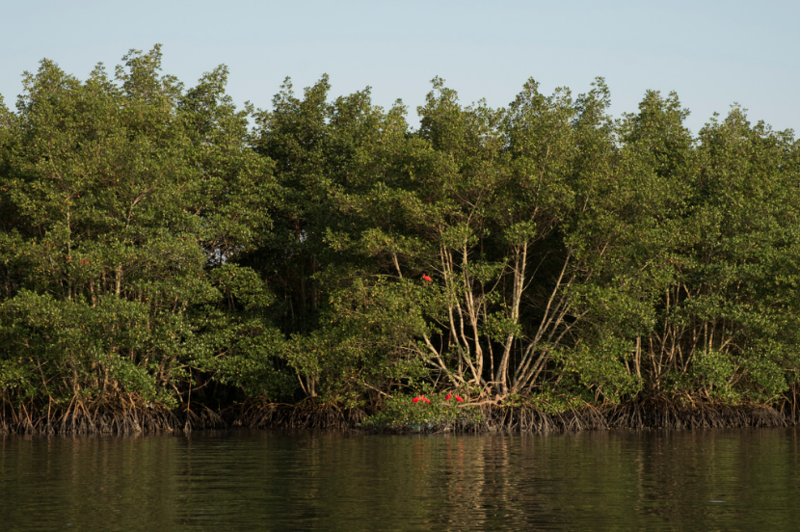 The community where I lived this process with a wonderful group of 16 Warriors is called Vila dos Pescadores (Fisherman’s Village), located next to Santos in a city called Cubatão, right into the mangrove ecosystem. 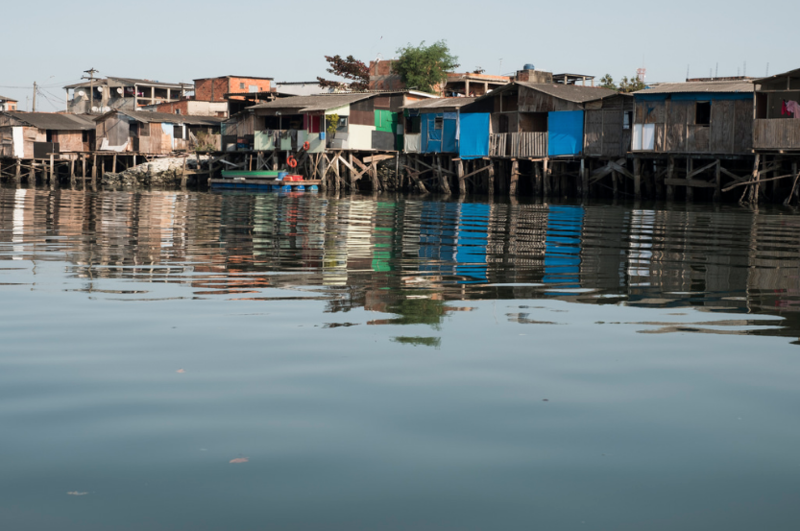 A community with a population of more than 30 thousand people, most dwelling on stilt-houses with structures that go as deep as 10 meters into the sand to allow stability. 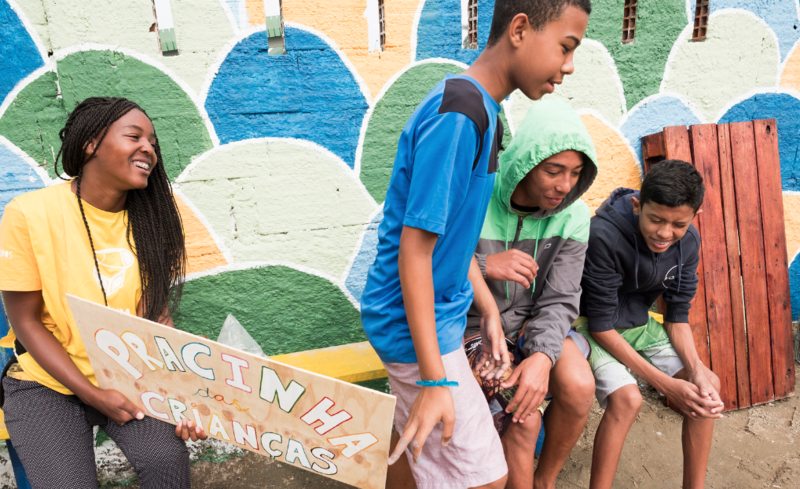 While the village is considered to be an irregular occupation, the question of replacing the population elsewhere is delicate to consider (like in many other communities in Brazil). Experiencing Elos methodology at Vila dos Pescadores allowed us to get to know the story of that wonderful place and of the wonderful people who dwell there. 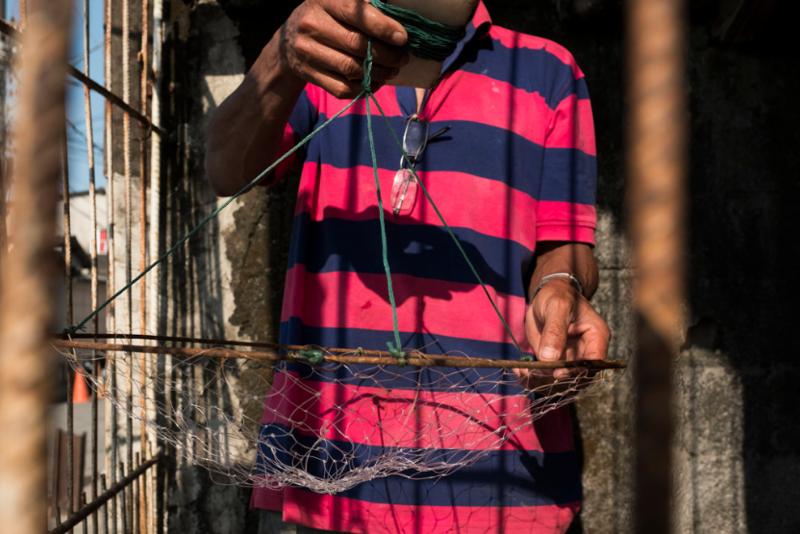 Their culture of fishing which is passed from father to son, the meditative state of mind that takes local fisherman to seek not only fishes but also peace and contemplation while alone in the sea, the mangrove regeneration effort that was carried by a local fisherman who is now remembered with pride and which has brought back a species of bird called Guará that was extinct, the care of an elderly lady who lives with her cats and gives plants to her neighbours as a way of showing affection, the infinite love and curiosity from the local children, the wise man who owns ten dogs and collects discarded objects on the streets to upcycle them into new objects…so many stories were discovered in the process of being open to that community and to a way of life that was unknown for most of us becoming Warriors. 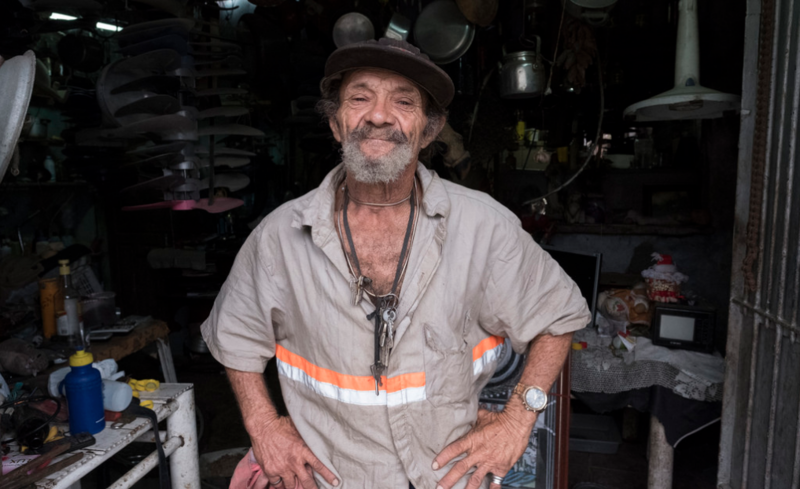 Once we, Warriors, became more familiar with the place, and the local community more familiar with us, it was time to Dream; we went out on the local streets offering people a Brazilian desert called sonho (which means dream) in exchange of them telling us a personal or collective dream. 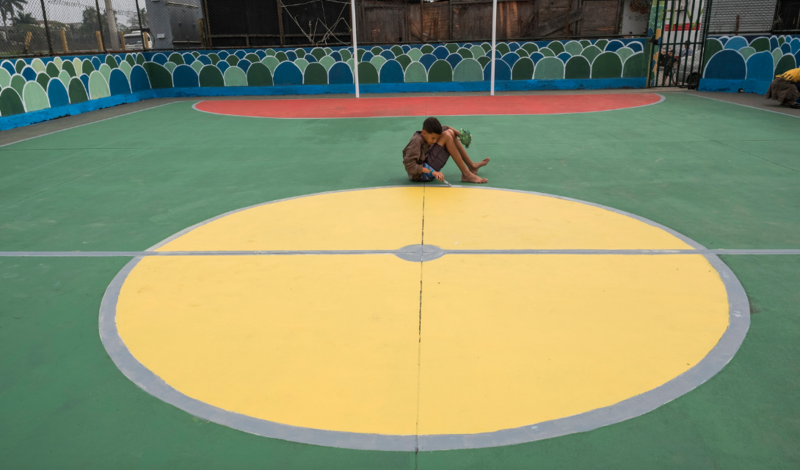 We came to learn that the community dreamt of having a space for their children to play, learn and flourish. So we started to work on this plan! 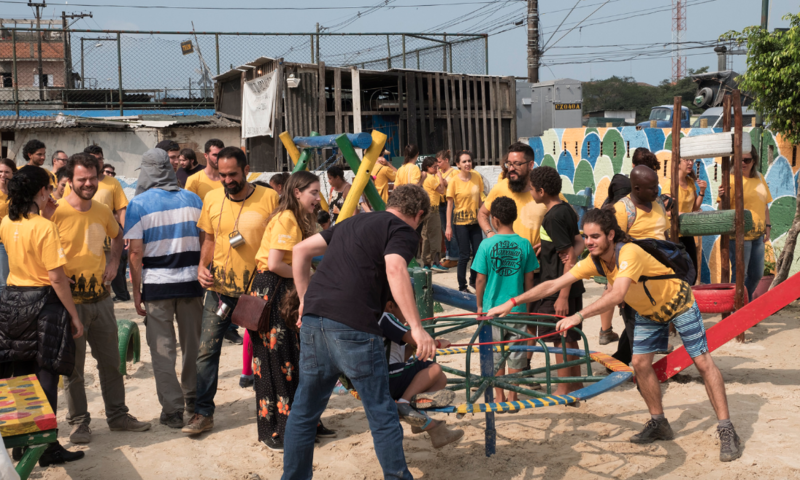 In the Care-step we invited the community to collectively design the space they dreamt of, supporting the definition of strategies for collective action and identifying a place inside Vila dos Pescadores to materialize the children’s center. 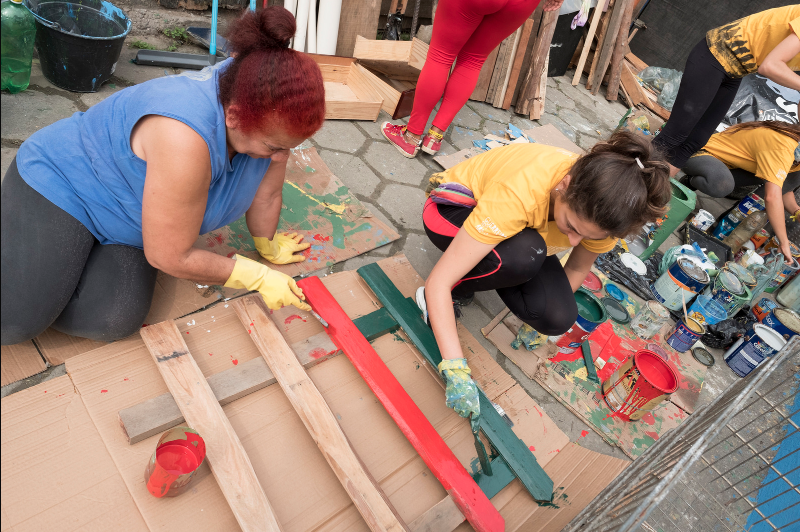 From painting the floor and walls, to building new public space furniture, all was created jointly by the hands of locals at Vila dos Pescadores, the Warriors, and people from other communities (with joint efforts also in the donation of construction materials). 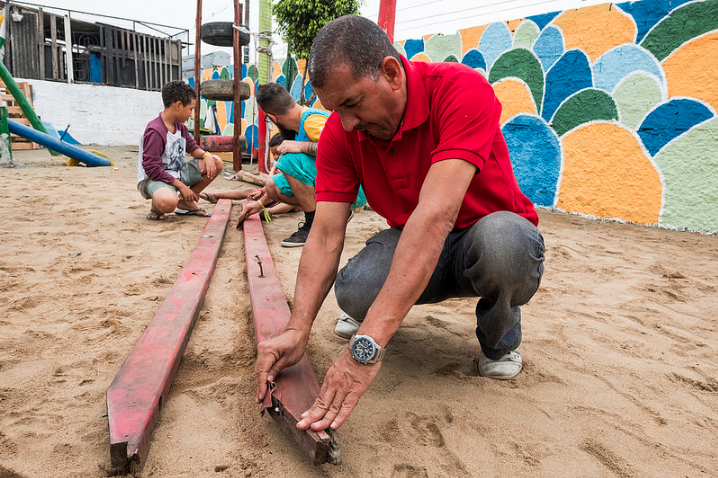 What came out of the Miracle were a regenerated plaza, a sports court and playground with new furniture, and a temporary container where the children can now play and learn. The awe in the eyes of the children and of all the community who took part in this process showed that the faith factor was being reinforced by each collective accomplishment. Deep inside, they always knew they could do it, and we Warriors were there as a catalyst to redirect this faith into action (both their faith and our faith of empowered communities). 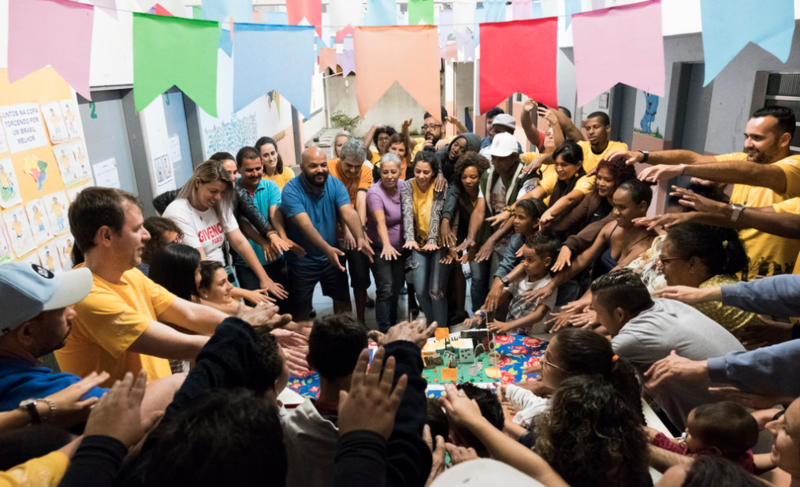 There are many reasons why, at the end of the 4-days of hands-on action, we Celebrated with a sense of joy and gratefulness the work that had been done on the physical and subtle level of both the place and the expanded community that helped build it. Right at this moment, the Fisherman’s Village is in the Re-Evolution process. This means that the hands-on was not the final piece but a seed and a prototype of what can be done through community action. Instituto Elos and the Warriors Without Weapons are now working with the community via different meetings to help potentialise community action and make it into more tangible dreams. So much awareness of their capability to act is coming out of this process and it has been beautiful to see how they find their own ways of organising new strategies. Not only Vila dos Pescadores, but also we Warriors are living a Re-Evolution process. I can say that one does not suddenly become a Warrior Without Weapons after the 32-days immersion…one gradually becomes a Warrior while allowing the learning to mature in its own timing and practicing it on the day-to-day life. For me, this has been a multiple experience of practicing the dream muscle, being more attentive to the abundance and the beauties presented daily, and caring more for the needs of all around me. Becoming a Warrior Without Weapons has taught me that the more I give, the more I feel complete and that serendipity (unplanned and fortunate discoveries) will always come along in the beautiful complexity of community action, and of life. More and more I believe that the world we dream of is being built, right now, while we put our love – which is something natural – into action. Guerrieri Senza Arme è una immersione di 32 giorni creata dal Istituto Elos (1), che succede a Santos (Brasile) per che imprenditori sociali possano assorbire tecniche di leadership per il lavoro in comunità, imparando la metodologia creata tramite la pratica del istituto per 20 anni in varie comunità. Sono stata fortunata di partecipare dell’immersione a Luglio 2018 con altri trentasette giovani di dieci paesi, un’esperienza che ha causato un impatto veramente positivo e mi ha insegnato che è possibile, collettivamente, creare il mondo in cui sogniamo.